International Women’s Day falls on the 8th March each year, which opens up opportunities for both articles discussing women in electronic music and also special events to coincide with the day. 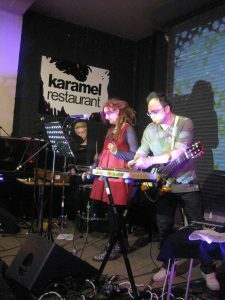 Collage Nights is a venture staged at Karamel Restaurant in London that puts on an eclectic series of DJs and live performances. For IWD they decided to focus on female-fronted outfits, including pop folk group Penniless Cove and the medieval celtic speed folk outfit PerKelt. 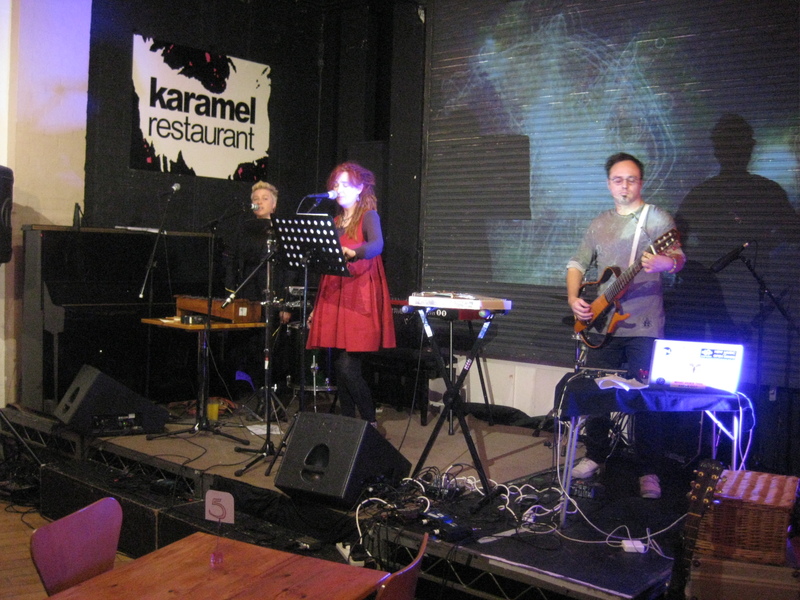 Also on the bill were Autorotation, the electro-acoustic outfit that had popped up on TEC’s radar previously. A perfect opportunity then to check out the 3-piece unit in live performance. 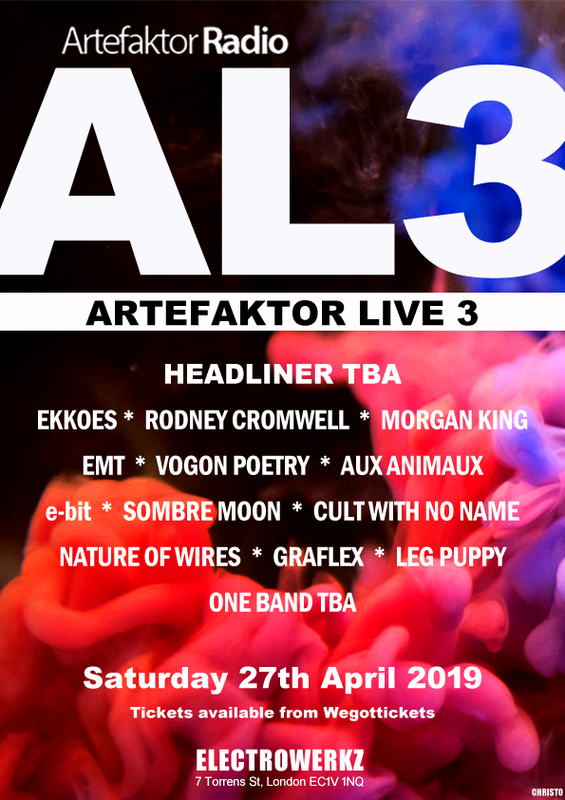 Consisting of Robyn Sellman (vocals, visuals), Laura Tanner (vocals, percussion) and Igor Olejar (guitar, electronics), Autorotation have been involved with music for a number of years. They’re also no strangers to live performances (including sharing the stage with dark pop connoisseurs Dicepeople). Kicking off their set with their live rendition of ‘Swamped’ (the track that TEC reviewed previously), the song has a minimalist electronic feel to it which is crafted from a mix of acoustic and electronic percussion, some guitar and Robyn’s ethereal vocal style. Meanwhile, ‘Instant Love’ signals the fact that the band “have only written 2 love songs before – and this is one of them”. The song has an odd accordion-esque intro to it combined with a slow military percussive beat. There’s a slow, languid feel to the song and it’s topped out by some fine harmonic singing between Robyn and Laura. ‘Dragon Fly’ comes up next which is a shimmering gossamer-coated song which features Igor playing a portable dulcimer. Despite the ethereal elements of the track, there’s a much more bassy foundation to it and with Robyn’s choral trills topping it out, it brings to mind the operatic style of Austra’s Katie Stelmanis. Closing the set out, Robyn introduces ‘Buran’ with a story about the song’s inspiration. Buran had been the USSR’s attempt at their own version of the US space shuttle. The spaceship only had one successful flight in 1988 in which it managed to complete its mission and landed less than 3 metres from its target mark. The collapse of the USSR collapsed plans to go forward with the programme, which leaves us with songs looking at the romance of spaceflight! ‘Buran’ itself kicks off with ambient radio chatter and has a spacey feel to it, augmented by more harmonic singing from Laura and Robyn. The song builds into a more discordant collage of sound before more radio samples close things down. Outside in the venue lobby, the members of Autorotation were also demonstrating their VR video which takes a combo of smartphone and VR headset to present a 360-degree immersive video of the band in action for the song ‘Get Out’. VR technology has come a long way in recent years, but it’s surprising how effective the immersive elements of the technology can put you at the centre of the action. The fluid movement around the ‘room’ simply by moving your head is flawless. For a band, Autorotation switch things up quite nicely in the world of electronic music – and also demonstrate that they’re a band keen to experiment in the world of new technology. Autorotation are performing live downstairs at The Harrison on 14th May 2017.